Facing Mont Blanc, with its 425 km of slopes for different types of skiing at all levels, the Paradiski environment reserves a wealth of surprises by the multitude of activities on offer in the various resorts. Snowboard, freestyle skiing, paragliding skiing, off piste skiing, snowshoe trails, snow scooter rides or husky sleighs, the ski resorts of La Plagne and Les Arcs are great for mountain holidays with family or friends. For your holiday rentals, Pierre & Vacances offers low accommodation prices in Savoy residences. The infinite enchantment of a residence at the foot of Mont Blanc. The Alps in summer offer a great setting for outdoor activities. A Deep Nature Spa® its own indoor pool. The price shown is per accommodation, for a Apartment Standard 1/2 bedrooms, 6 people from Sat 06 July to Sat 13 July 2019 . A car-free resort that offers a wide range of outdoor activities, sports and relaxation. Residence in close proximity to entertainment and the shops. 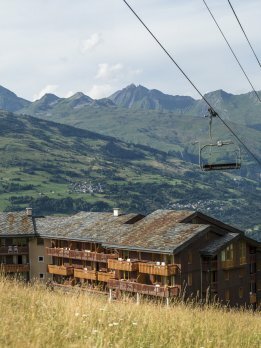 A lively, car-free resort overlooking Mont Blanc. Le Belmont, a residence on the edge of the forest and 500 metres from the centre of the resort. Loisipass residence: free leisure credits to make the most of the activities on offer (one Loisipass per week per apartment). A lively, family-friendly, pedestrianised resort. Spacious, very comfortable, south-facing apartments. A wide variety of entertainment in the resort. The price shown is per accommodation, for a Apartment Standard 1 bedroom, 4/5 people from Sat 06 July to Sat 13 July 2019 . Car-free resort, a veritable playground for children and teenagers. A residence near the centre of the resort. Loisipass residence: free leisure credits to make the most of the activities on offer. The price shown is per accommodation, for a Studio Standard 3/4 people from Sat 06 July to Sat 13 July 2019 . A charming village resort with a friendly atmosphere and rich heritage. An Aquatik residence with unlimited access to the resort's outdoor swimming pool. The price shown is per accommodation, for a Studio Standard 3/4 people from Fri 05 July to Fri 12 July 2019 .